See where fortune takes you when you splash on 14 La Temperance by Dolce & Gabbana. This fragrance was introduced in 2009 by the famed Italian fashion house Dolce & Gabbana as part of an anthology of fragrances, each based on a different tarot card. Inspired by the Temperance tarot card, this scent is a mixture of pink pepper, ambrette, iris, rose and hibiscus notes, creating a beautifully balanced and harmonious blend. Wear this versatile fragrance day or night for an aromatic delight. 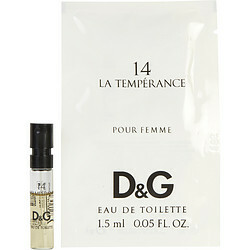 D&G 14 La Temperance is one of my favorites!! It’s light and mild so if you easily get headaches from strong smells then this one is a great way to go. I love it for everyday wear it’s clean and sweet! I wish there were more than just sample size available. D&G 14 LA Temperance has a very slight scent-would make a great gift for a young teen just starting to enjoy wearing cologne. This fragrance I would not recommend for women looking for a lasting aroma. It has no staying power for a woman on the go, because after the first mist it is a miss and go.